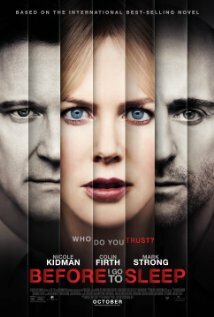 Great little thriller/mystery about a woman (Nicole Kidman) who has amnesia and loses all short term memory of the previous day when she sleeps. Her loving husband (Colin Firth) keeps everything secret from her. She secretly keeps a video diary and is being treated by a neuroscientist (Mark “Sinestro” Strong). She slowly learns the truth, with a number of twists and turns before the final reveal. Strong acting, good cinematography, and it’s on Netflix. This entry was posted in movies and tagged before I go to sleep, colin firth, mark strong, movie, nicole kidman, review. Bookmark the permalink.